Detail of drawing by Jean-Édouard Dargent (better known as Yan' Dargent) to illustrate a section about Edgar Allan Poe's The Unparalleled Adventure of One Hans Pfaall in Jules Verne's Edgar Poe et ses œuvres (1864). A hot-air balloon figures prominently in “The Angel of the Odd,” published months after Poe’s infamous Balloon Hoax. Soon after Edgar Allan Poe moved to New York City in 1844, he submitted a report to The New York Sun, which rushed out an “Extra” edition with the front-page headline, “ASTOUNDING NEWS! BY EXPRESS VIA NORFOLK! — THE ATLANTIC CROSSED IN THREE DAYS!” Poe’s article described the first manned balloon flight from Europe by Monck Mason, who had landed safely in Charleston, and the story was picked up the next day by the Sunday New York Times. 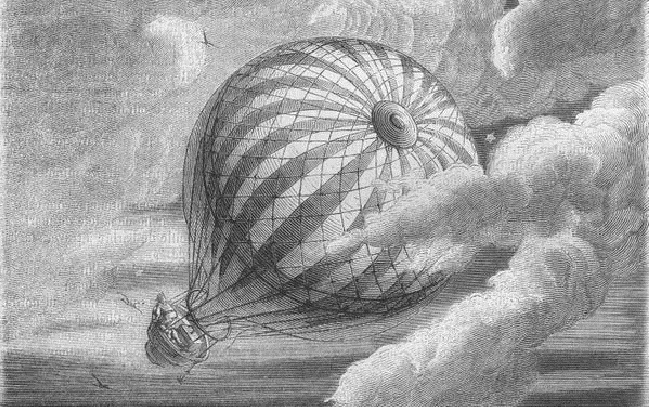 By Tuesday, however, the editors of The Sun realized that they had been had; although Thomas Monck Mason was certainly the name of a famed European balloonist, the entire work was fiction written to resemble a work of journalism. Although the Critical Companion to Edgar Allan Poe acknowledges that it was one of Poe’s more popular pieces when it first appeared, the story has not received much scholarly attention. It was resurrected a century ago in the 1920 collection The Best American Humorous Short Stories and in the last half century has become better known in France, thanks to its inclusion in André Breton’s celebrated 1966 publication, Anthologie de l'humour noir. Yet familiarity with these long-forgotten books and literary squabbles is not essential to understanding Poe’s story, which turns rather quickly to pure, uproarious farce. Like a number of other tales, such as “Never Bet the Devil Your Head” (a previous Story of the Week selection), “The Angel of the Odd” shows a less-familiar side of Poe: his sense of humor. It was a chilly November afternoon. I had just consummated an unusually hearty dinner, of which the dyspeptic truffe formed not the least important item, and was sitting alone in the dining-room, with my feet upon the fender, and at my elbow a small table which I had rolled up to the fire, and upon which were some apologies for dessert, with some miscellaneous bottles of wine, spirit and liqueur. . . . If you don't see the full selection below, click here (PDF) or click here (Google Docs) to read it—free!